PC enthusiasts will have likely digested the HEXUS Nvidia GeForce RTX 2080 Ti and RTX 2080 review thoroughly by now. Many will have looked closely at our modest overclocking attempts/results using the stock but new and improved air cooler supplied fitted to the Founders Edition cards. 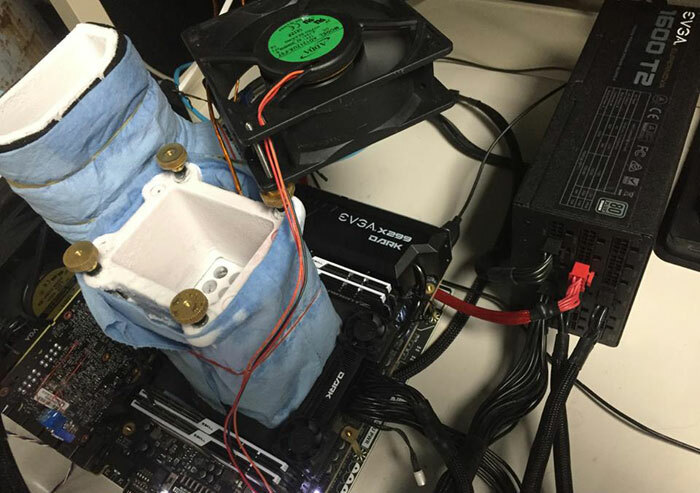 However, the extreme overclockers have already been at work and one of the best known OC celebs had already taxed his Nvidia GeForce RTX 2080 Ti FE under LN2 cooling. 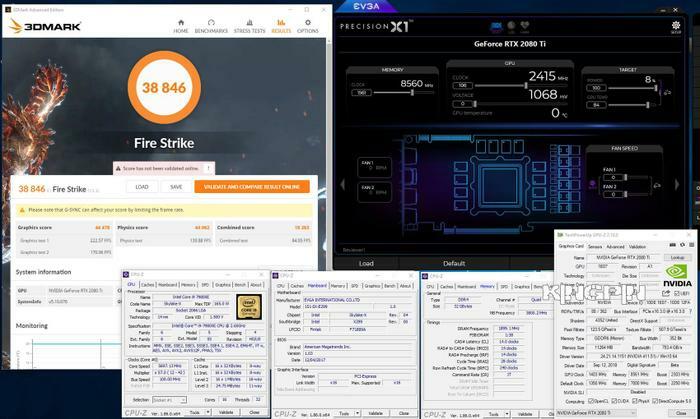 EVGA's Jacob Freeman took to Twitter late yesterday to exclaim a simple "wow", while sharing Kingpin's latest 3DMark Time Spy achievement. That headline result was 18,925. You can find this official 3DMark Hall of Fame result online here under the Time Spy, single GPU category. However, Kingin, AKA Vince Lucido, didn't stop there. He went on to smash single GPU Hall of Fame records in all the other Time Spy benchmarks, and all the Fire Strike (Ultra / Extreme / Standard) benchmarks. Complementing the info shared on the official 3DMark pages, Kingpin shared screenshots of his benchmark achievements via his Facebook page. These images reveal his test setup PC specs, with desktop screen grabs showing the Time Spy / Fire Strike record scores alongside CPU-Z, GPU-Z and EVGA Precision X1 windows. An Nvidia GeForce RTX 2080 Ti with LN2 cooling, and a GPU clock of 2415MHz at a voltage of 1068mV. Graphics memory clock of 8658MHz (17226 MHz effective). 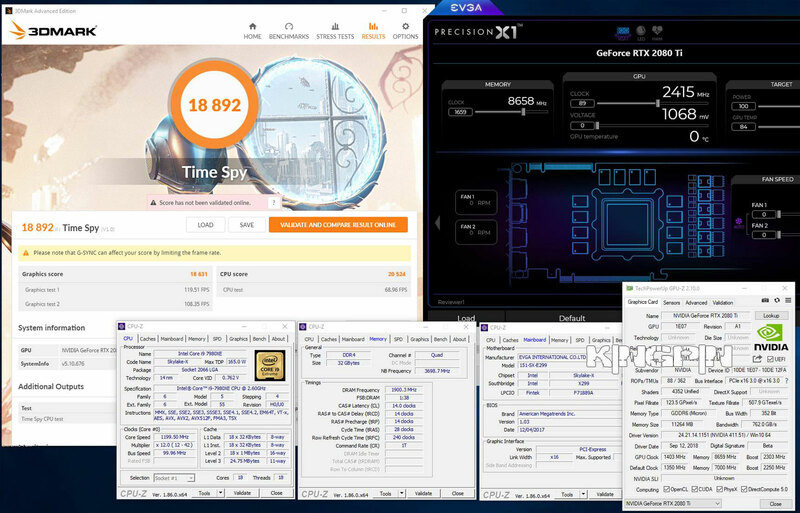 An Intel Core i9-7980XE processor cooled with LN2 and overclocked to 5.5GHz on all 18 physical cores. 32GB of G.Skill Trident Z quad-channel DDR4 RAM. An EVGA X299 Dark motherboard. It is notable that Kingpin has 'volt-modified' the reference card beyond limits set by Nvidia. Meanwhile, readers should stay tuned for details and tests of third party GeForce RTX-20 Series graphics cards. For reference, Hexus scored it at 12,847. Why do they have to have a silly name, its not like they are a Superhero and is'nt the world already over populated with a to z list celebs, do more really need to be added. You've never heard of kingp1n ? He's the current big-wig when it comes to overclocking, or one of the few. You know like niche markets tend to only “allow” one or 2 big names ? He's one of em. AFAIK he passed over the guy who did all the Asus gear. But ya, for niche markets, there's usually 1 or 2 people who are “allowed” to be famous lol. Hell I even know the one from something as obscure as hot dog champion. And yes, my life is as sad as you imagine it, thanks for asking! I only heard of that person since I vaguely remember a hardware component which might have had that name on it.